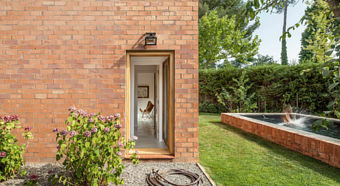 Designed for a family of five, this detached house is located in the Catalan town of Sant Cugat del Vallès close to Barcelona in north-eastern Spain. Its green spaces, parks and sports facilities make it a popular place to live. 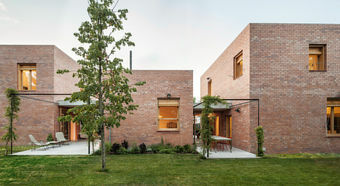 Built in 2013, this detached house of exposed terracotta-coloured brick comprises three individual buildings of different sizes and heights. 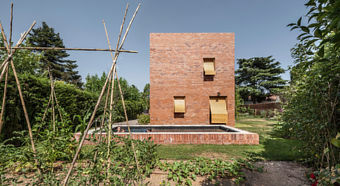 According to the judges of the “Building with Brick” design initiative, the skilful juxtaposition of these cubes creates “exterior and intermediate spaces (..) that demonstrate a high degree of spatial quality”. 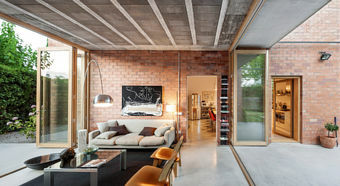 Every three years, leading German brick manufacturers and the Association of German Architects (BDA) come together to award the Fritz Höger Prize. 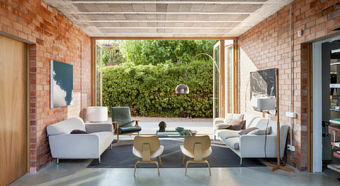 In 2014, the Spanish architecture firm HARQUITECTES won the gold medal in the detached and semi-detached house category for its “1101 House” in Sant Cugat del Vallès. In the words of the experts, “With carefully placed openings and the intermediate spaces they have created (…), HARQUITECTES have succeeded in bringing multiple layers of depth into this group of spaces, demonstrating a great feel for space”. 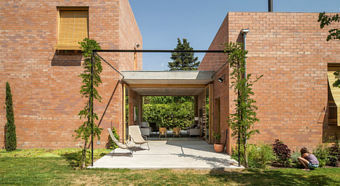 The unusual layout of the various parts of the building creates a very close relationship between the structures and the garden, each acting as an extension of the other. 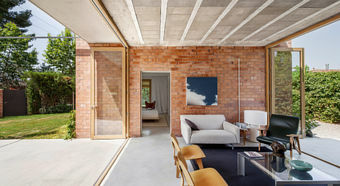 The cubes themselves are connected by two fully glazed, roofed spaces fitted with floor-to-ceiling folding sliding doors on both sides. 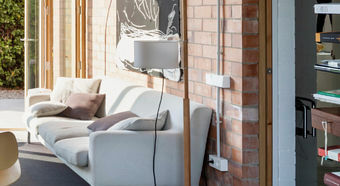 When the windows are open, these connecting spaces function as terraces. 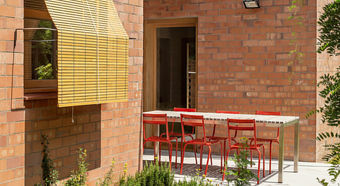 Located in the structure between the parent’s area and the kitchen is the family’s living room, which serves as a winter garden in winter and a veranda in summer. The second connecting space, which joins the children’s area to the kitchen, contains the entrance hall. 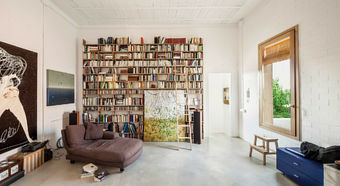 The tallest part of the building houses the parents’ bedroom and above it the studio. 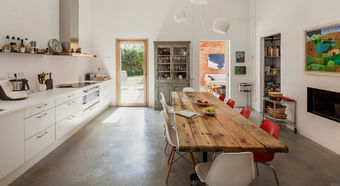 By contrast, the central building comprises just one storey and contains the large kitchen/dining room. The third, two-storey building is home to the playroom on the ground floor and the three children’s bedrooms upstairs. 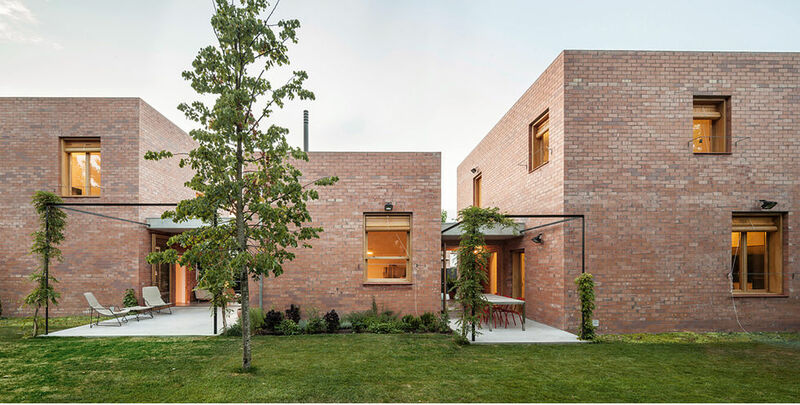 What is particularly striking in this house is that the three cubes have only a few relatively small windows. The small amount of glass reduces the amount of direct sunlight shining into the house to almost zero. At points where protection against the sun is required, external roller shutters in varnished Douglas pine have been fitted. Once lowered, they can be hung over metal bars protruding from the walls to provide optimum ventilation. 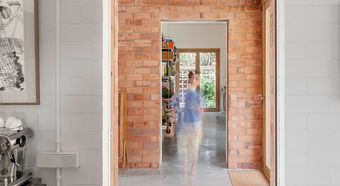 The heat-insulated, double-skinned, rear-ventilated brickwork creates a pleasant indoor climate. 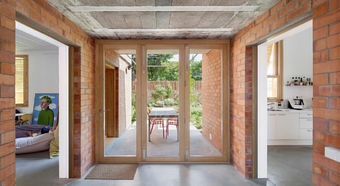 The grassed flat roofs help to counteract the build-up of heat in the rooms on the top floors. 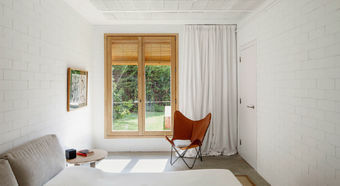 The rooms themselves are heated by a geothermic heat pump and underfloor heating in winter and cooled with cold water in summer. Some of the interior walls are painted white, others are in red brick. Together, the art-collecting couple decided on JUNG’s classic LS 990 switches and sockets in white, creating a striking and stylish effect when surface mounted on the bare stone walls of the kitchen and living room. Designed by Spanish architects HARQUITECTES, the 1101 House makes a striking impact with its unusual layout, creating an impressive combination of interior and exterior. 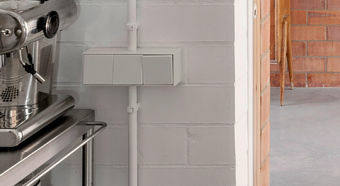 LS 990 surface-mounted he classic switch LS 990 as a surface mount variant has an aesthetical appearance on concrete or natural stone. The surface caps already have a pre-shaped frame design and no additional components are required.